Will Bob Orton Appear ? Who will be first to reach for the mens MITB ? Who will be first to reach for Womens MITB ? 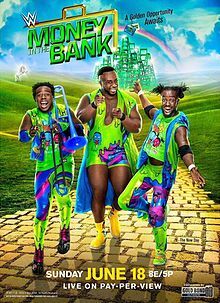 Who will be first to reach for the mens MITB? Who will be first to reach for Womens MITB? Bummer that this is a double points round, I wanted to make some crazy predictions. I had a thought last week about something very Vince, and very marketable. That is Mr. And Mrs. Money in the bank, not Carmella and Ellsworth, but two surprise entrants, The Miracle and Maria. The shock, the heat and the instant impact for a debut of an unknown, and a known to make sure they actually make an impression with current WWE fans. Honestly, I'd book it. It's been a while since something genuinely interesting happened. 6 men and 5 women has always made me think maybe someone will be added to at least one of the matches. I'm not sure about this one. People may recogise Maria, but a lot would have no idea who The Miracle is - I certainly wouldn't! I think a woman may be added to the lady's side of things (Asuka? ), but 6 is enough for the chaps, especially as there are enough back stories supporting the match. I know Grec, it was just something that popped in my head as I was wondering why they hadn't showed up yet and it just seemed like something Vince could get in his head that he likes the sound of a couple winning. Which is usually all it takes with Vince haha. It won't happen, although I'm not sure being known always matters for WWE. the reaction would be flat on the debut if it's announced and you aren't known (and he really isnt in those terms) that is true, so that element would not work unless it was done in such a way that he just spoiled it for everyone. If they cost Nakamura and Styles in the final crescendo they would soon BE known, but that would mean he was an unannounced entrant who mysteriously appears during the match which would be pretty sucky in logical terms. I could see Maria being a 6th announced entrant though, last minute signing type thing. Asuka would be way better though, then there would be the whole fear factor element to her having the case whilst still being an unbeaten champion. The psychological games she could play with all the SD champions whilst still defending her title in NXT takeover matches, they could let that run long tern and it would still be interesting. A genuine 'when is the cash in coming' hype surrounding all SD womens title matches.